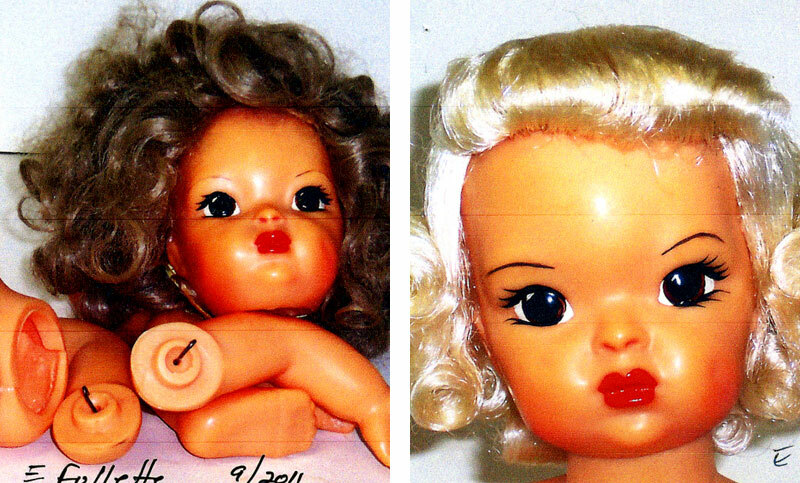 A visit to Sherry's Terri Lee Doll Clinic can do wonders for your treasured Terri Lee. Most defects can be repaired, take a look at a few of our success stories. Modern Terri Can be a Problem Child Too! 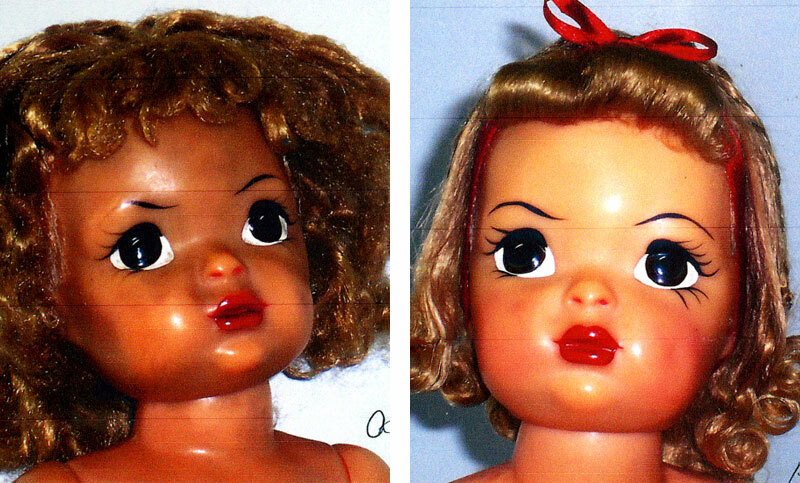 These two modern Terri dolls, Terri Lee and Chico, were produced after 1999. These later Terri Lee's oftern have problems with spliting plastic. Occasionally their torsos will even warp out of shape. This Terri Lee and her pal Chico have been completely repaired and restrung. This is another example of a modern Terri — but this time a very, very special one. She was hand painted by noted Terri Lee artist, Lee Platt. Poor Terri was knocked off of her shelf by another, jealous Terri Lee doll. After a little cosmetic surgery she still has a very faint line where the original break was but she looks so much better! This painted Terri Lee was produced around 1948. She spent a few days with us here at the Doll Clinic and recived a careful cleaning, a brand new manikin wig, and was restrung. She also had a bit of make-up work, new blush and a lip touch-up. This is a Terri for Today's Girl. On this model their heads, arms, and legs are attached with a ball and socket. 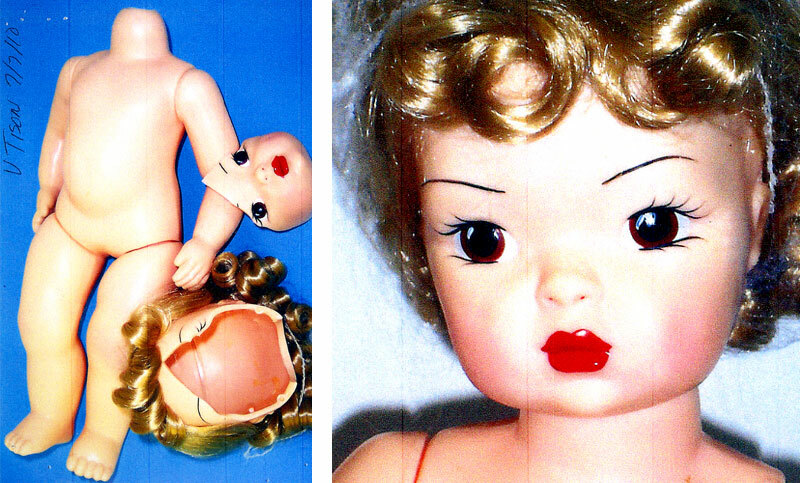 Occasionaly when these dolls are dropped something will break off. 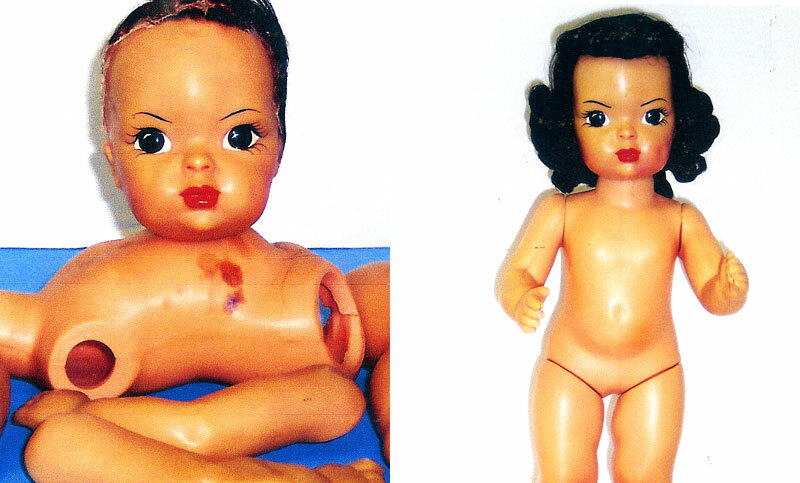 Fortunately they can be repaired at the Doll Clinic. This is a PATPEND. Terri Lee. She was probably made between 1950 and 1951. She still has her original "raysheen" wig and the coveted "S" eyebrows. She was probably painted by Carol Hayzen in Lincoln, NE. She has now been cleaned, restrung, had her wig restyled and her face touched up. 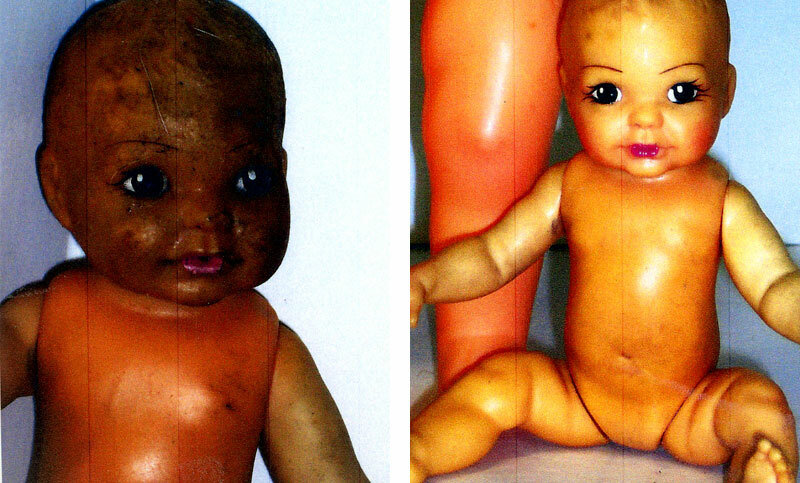 This is Linda Baby and she's wearing 50 years of dirt and grime. He vinyl skin has become sticky and has developed air bubble pits in her skin. 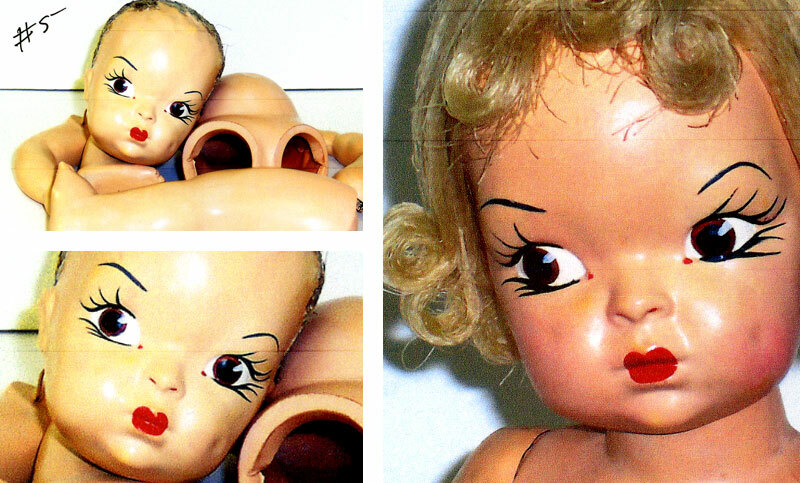 She was treated at the Doll Clinic and after a careful cleaning and a bit of cosmetic touch up she's feeling much better. 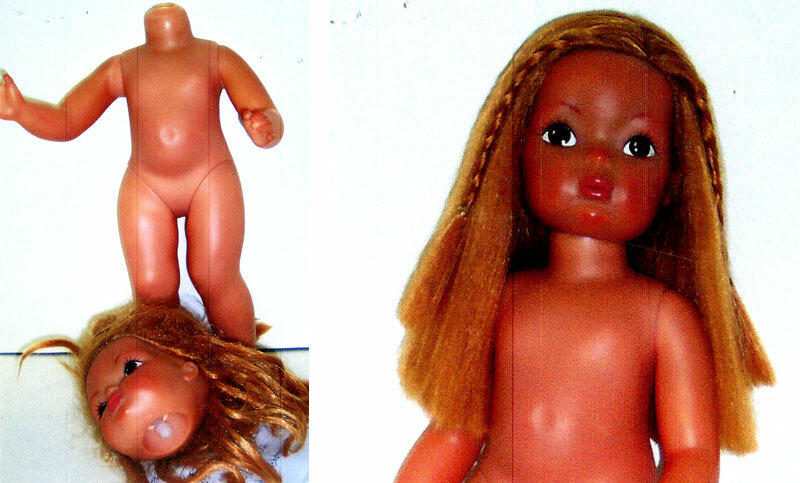 This Terri Lee had fallen apart and needed a new wig. She has now been restrung and has a lovely new Terri Made wig that closely matches her original locks. Her brows and lashes were also touched up. With a missing left leg and a mousy, commercial-replacement wig straight out of the 80's, this Terri needed some help. After her stay at the Doll Clinic she has 4 matching limbs, a touched up face, and a beautiful new Terri Made wig. When these TIny Terri Lees made a visit to the Doll Clinic the brunette was missing both arms and they both needed to be restrung. They also had their hair restyled and cosmetic touch ups. This charming boy is Jerri Lee. He may have started life as a blonde but he makes a dynomite brunette in his new Terri Made fur wig. He had a few facial touch ups as well.